Preserving the rich heritage of traditional Appalachian arts and crafts is a passion for artisans throughout the Smokies. Their creativity and craftsmanship is on display at more than a dozen Bryson City area shops and galleries. For some of these artisans, preserving that heritage includes sharing their knowledge through classes in pottery, weaving, basketmaking and quilting. Elise Pincu Delfield offers classes to locals and vacationers of all ages at her Bryson City studio-gallery, Pincu Pottery. Above, she introduces students (l-r) Katharine Beckwith, Haylee Gerard and Gillian Gerard to the potter’s wheel. For other vacation learning opportunities in the Bryson City area, visit the “Learn Something New” page of the Bryson City online travel guide. Thank you so much for including Pincu Pottery on this site! 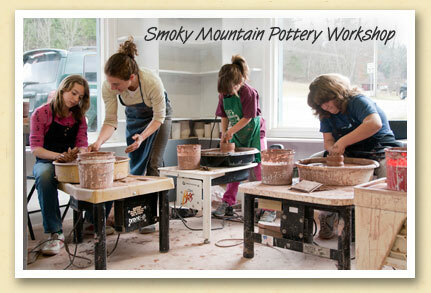 Bryson City has so much to offer and I am proud to live here and be able to offer clay classes to locals and visitors. This area of North Carolina is bursting with outdoor activities AND art/craft activities, not just art/craft shopping. So glad the word is getting out!